Lobbyists associated with and funded by Saudi Arabia are reported to have purchased a total of 500 nights at Trump’s D.C. hotel over three months in the time shortly after the 2016 election, per WaPo. The transactions were part of a campaign that used veterans as lobbyists to roll back legislation that put heavy legal costs on Saudi Arabia after congress blamed the country for its role in 9/11. Those involved provide conflicting stories as to who knew about Saudi participation, to what extent and the coincidence that this all took place under the president’s roof. Jason E. Johns, an army veteran and Wisconsin lobbyist, served as the primary organizer of no less than six campaign events held at the hotel in the span of three months. He was being paid by the Saudi lobbying group, Qorvis MSLGROUP. This stream of apparently coincidental events began in December of 2016, when Qorvis told Johns that he needed to get another group of veterans ready to campaign on short notice. He only had a few days to put the event together, so he decided to call up Trump’s D.C. hotel on a whim. Johns asked if he could get a discount for a group of veterans, the hotel said yes and that was the end of that. Johns would sweep the connection under the rug, even in light of Trump’s alleged connection to Saudi Arabian Crown Prince Mohammed bin Salman in the killing of journalist Jamal Khashoggi. He describes the decision for the Washington Post: “I just out of the blue decided, ‘Why not call the Trump hotel?’ ” he said. “I said I was representing a client, a group of veterans…Did they offer any discounts for veterans? And they said yes, they did have availability.” He was so satisfied with his experience that Trump Hotel became his go-to for future events. Apparently the price was right, but Johns wouldn’t know. He swiped the credit card given to him by Qorvis for everything and never saw a single bill. Johns would send out emails to fellow veterans offering an all-expense paid trip to D.C.—as long as they lobbied. Veterans were fine with that stipulation but many were unaware of who was footing Johns’ bill. The trip stood out for a few reasons, even before they were made aware of the Saudi connection. Veterans also noticed they were doing a pretty bad job of lobbying, mostly due to the organizers’ directions. They were thrown into discussions with legislators with little to no information about what they were arguing over or how to do so, which left many representatives unchanged in their decisions. Veterans would then be asked to meet with those same people up to three more times, despite clear lack of interest from the legislator. Veterans were armed only with a set of fact sheets, that read in small print at the bottom, “This is distributed by Qorvis MSLGROUP on behalf of the Royal Embassy of Saudi Arabia,” per WaPo. Though his group members say they were unaware of how the trips were being funded, Johns told WaPo in a phone interview that he was explicit about Saudi involvement. He claims he began the trip with a statement that Saudi Arabia was paying for accommodations and that if anyone had a problem with that they were welcome to leave. One of Johns’ co-organizers disagrees. Army veteran Dustin Tinsley said Johns never came out about Saudi involvement, though when Tinsley himself was asked he was honest. Veterans confirm Tinsley’s side of the story, refuting that Johns was open about Saudi payments. 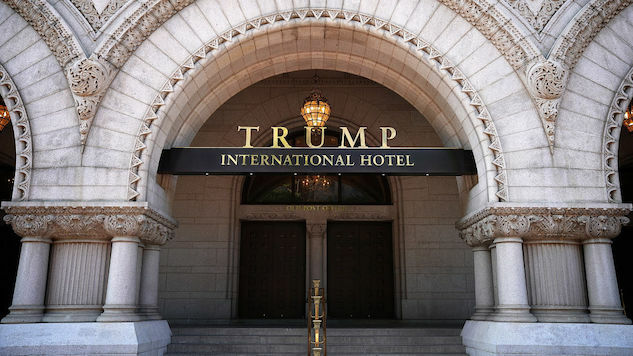 The average price of a room at the Trump Hotel is about $768. Johns never saw the bill, but recently released information suggests Saudis were only paying about $360. Johns insists the choice to continue holding his events in Trump’s hotel had nothing to do with gaining favor with the president. But maybe it does have something to do with the President gaining favor with Saudi Arabia. For three months, Saudi Arabia paid clearance sale prices for Americans to push its agenda in a building with the president’s name on it.